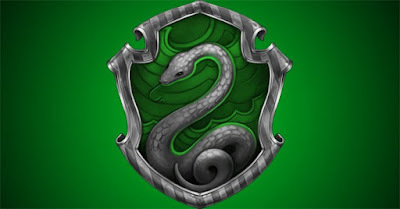 AuthorQuest: Slytherin is Best House? Here is an article about how Slytherin is the Best Hogwarts House (and Not Actually Evil) that I'm posting to try and justify to myself how not to be depressed that I was sorted into Slytherin. One thing I realized, one of the first things they do to convince you that you're not doomed is citing the good wizards that graduated from the snake pit. But... really the only one they can come up with is Merlin. The rest are from the Potterverse and while their evilness may be up for debate, they are certainly douchebags. Horace Slughorn is a harsh elitist. All the rest were turncoats -- Regulus Black, Severus Snape, and Draco Malfoy. They all pledged allegiance to evil characters until something didn't go their way. Something that affected them personally BTW. It wasn't like they saw a bunch of innocents get killed by Death Eaters and realize that maybe they were the bad guys. Snape became a double-agent when his childhood crush was killed and Malfoy just wimped out. But the common thread is all these guys used deception and manipulation to achieve their goals. Using evil to fight evil. Not sure how much credit you get for that. I do agree they have a pretty nice logo and color scheme though.